Since its launch a few years back the Citroen DS3 has been a runaway success for the French firm providing stiff competition to the all-conquering MINI and Fiat 500. On the back of this success Citroen’s DS premium arm has seen further models joining the line-up. Here I’m testing the larger DS4 to see if it can hold its head high in the same way its little brother can. It’s a bit of an odd car in that it has tall suspension, and a slick coupe-like roofline, but has 5 doors. The model you see here is the top-spec DSport fitted with the most powerful diesel engine available – a 163 bhp, 2.0-litre unit – mated to Citroen’s 6-speed automatic transmission. The DS4 is a striking car. Sure from the front it borrows plenty from the C4, perhaps a bit more than it should, but the rest is bespoke. The roofline is low and sleek with smartly hidden rear door handles and neat creases over the wheel arches look great. The premium feel is emphasised by the exquisite detailing. Enormous 19-inch Cairns alloy wheels look fab and everywhere you look splashes of high gloss finishes contrast nicely with the Pearlescent White bodywork. 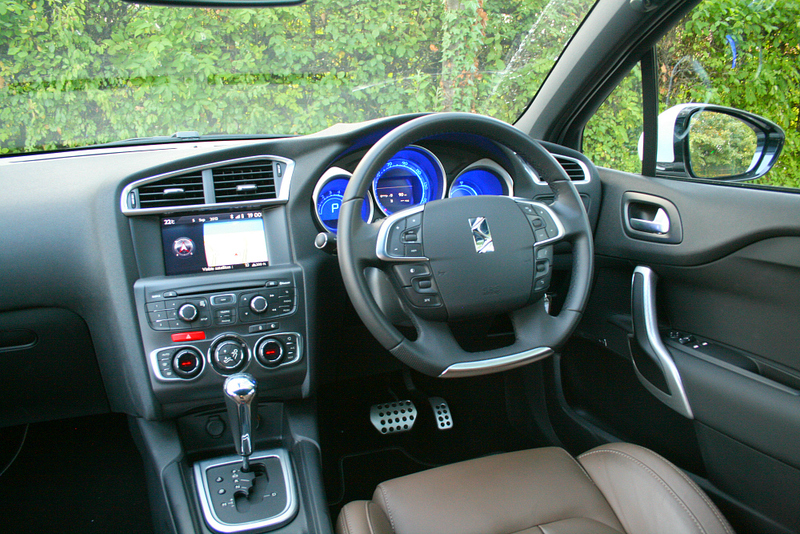 Inside the classy makeover continues to differentiate the DS4 from the ordinary Citroen C4. 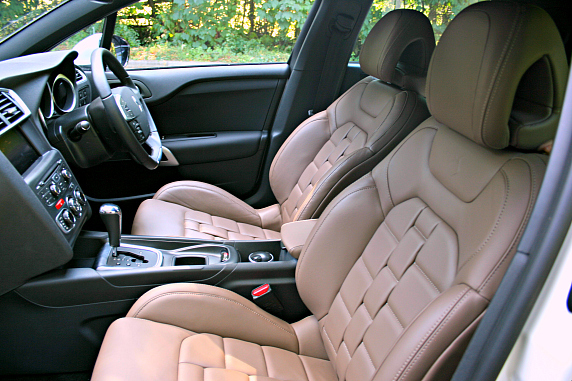 Lavish materials feature throughout with lots of metallic accents and mock carbon fibre trim on the centre console. The modern dials are a highlight and can have various shades of backlighting from grey through various shades of blue. Perhaps a bit of a gimmick, but still a lovely feature. 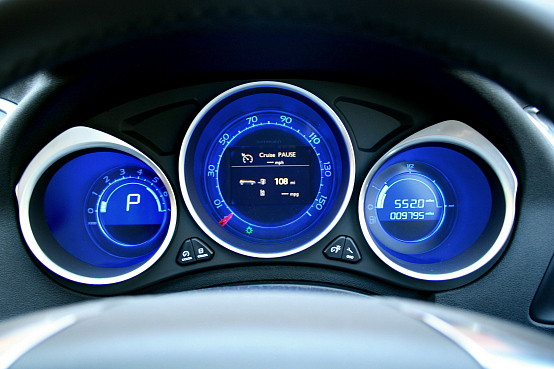 The dash design is a little lacklustre and although everything is where you would expect it to be, the steering wheel is littered with buttons. Stunning watch-strap effect Habana Club leather seats on my test car really lift the impression of luxury but they are a £590 cost option. Boy they are unbelievably comfortable though. Marketed as a spacious coupe there’s not a bad amount of space inside but particularly in the back it’s a very dark place to be. It’s also disappointing that form took precedent over function as the rear windows are fixed and the rear opening is very narrow making getting in a little awkward. That said it is still much easier than a three door coupe. The luggage compartment is a convenient size and shape too. Citroen is keen to stress that just like the DS3, the DS4’s ride and handling characteristics have been subject to a thorough reworking to improve handling and driver enjoyment over the C4. It seems to have had a profound effect as the DS4 has nice, progressive steering that is sharp and in corners it remains unruffled, resists roll and grips keenly. Despite riding on 19 inch rims the DS4 is also very relaxed. It has a forgiving ride quality that cushions poor surfaces well and only becomes unsettled when you encounter large manhole covers or mid-corner ruts. It’s also refined thanks to little wind or road noise and the engine too barely makes a noise. Under the bonnet the 163 bhp 2.0 HDi diesel unit is not only economical but has ample power for most situations and actually feels much quicker than the ten seconds to 60 mph would suggest. Power is delivered smoothly and there’s a great deal of flexibility. The 6-speed automatic gearbox is also impressive switching ratios smoothly and hardly ever getting confused. 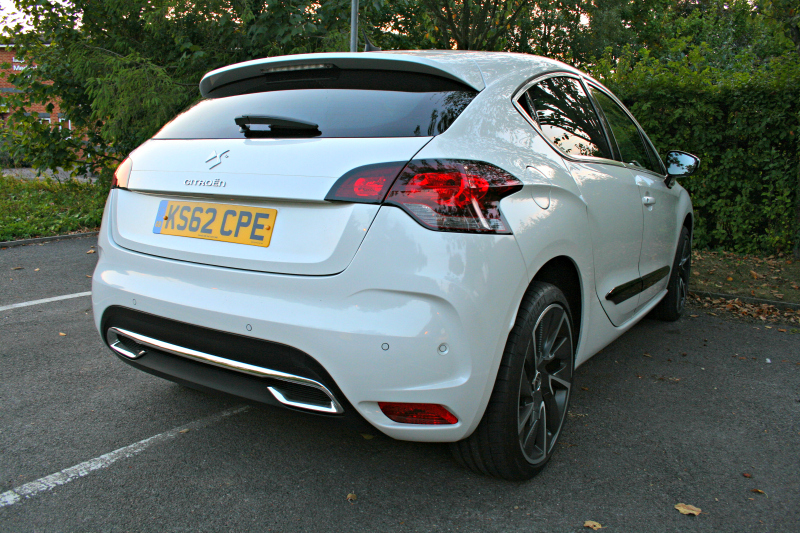 It makes it a doddle to exploit the DS4’s sharp dynamics and its laid back nature always shines through. The equipment tally across the range is worthy of the slight price increase over equivalent C4s. The range-topping DSport get goodies such as massaging front seats, a blind spot monitoring system, front and rear parking sensors with park space gap measurement, tinted windows, dual zone climate control and sat nav. You also get a massive panoramic windscreen with visors that slide back over your head flooding the cabin with light. We would however avoid the £1,190 Denon stereo upgrade as you will be hard pressed to notice the difference over the standard stereo unit. Personal Leasing options: from £276.59 per month including VAT. 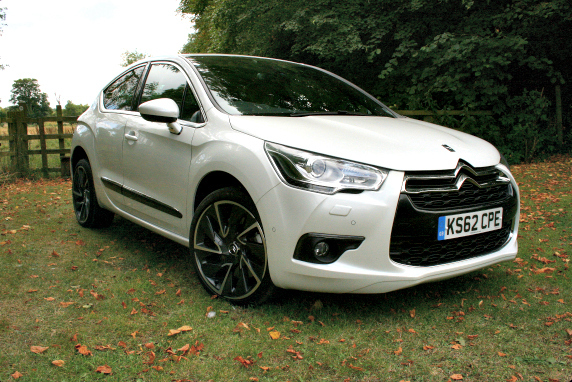 This entry was posted in Car Reviews, Cars, News and Views and tagged citroen, citroen ds4, full review, New car review by Rob McSorley. Bookmark the permalink.